Use textiles and rugs that have tropical floral prints in subdued colors, as well as classic leopard print. Pairing the two make for a bold statement. Include eclectic displays of island themed accessories. Hula girls, parrots, pineapples, and idle head ceramics are the go-to choices. Go on a thrifting adventure to search for affordable pieces of Hawaiiana or try eBay online. Faux or genuine bamboo details, such as picture frames, enhance the island feel even more. This texture can be used extensively throughout any tiki area without feeling overwhelming. Stick to light hues of paint. A soft but vibrant green is a good choice. 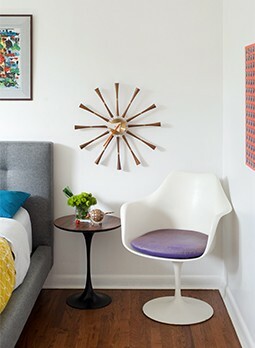 Lighter colored walls won’t compete with the splashes of neon appearing elsewhere.